From small meeting rooms or a large conference room, Arapey Thermal Resort & Spa offers each event a delicate approach and endless enthusiasm. It does not matter if you are planning a meeting about corporate strategies, a cocktail between intimate friends or a welcome banquet; our trained staff, and a refined production concept, will create the perfect atmosphere and menu, attending to your choice and need. Our advisors will accompany you at all times, in every detail, assisting your demands, collaborating in your design, seeking at all times the care and perfection of your event. 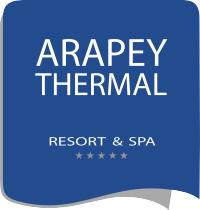 Undoubtedly, your preference will embellish your special occasions, and the seal of our experience will make Arapey Thermal Resort & Spa your permanent meeting place.